Rubbish Air – Must Be Indonesian? There are two places in the world I wouldn’t be right now. One is ISIS territory, clean shaven and sporting a crucifix, Shi’ite robe, or yarmulka. The other is on board an Indonesian registered plane. The Indonesians are officially one of the world’s worst when it comes to managing aviation. Don’t ask me. Just ask the family of the people killed in air crashes there in the last decade. Sorry to be so blunt, and for those in Jakarta like my friend Sima the journalist who may stumble across this blog and feel the flood of nationalism welling up in their veins, let me elucidate. The majority of Indonesian airliners are banned from operating in the EU because in safety terms, they are rubbish. Trigana Air which operated flight IL257 that crashed in the Ok Bape district of eastern Papua at the weekend was on the banned list. The airline has seen at least 15 – and some say 19 – accidents in 23 years. That some is FlightGlobal.com. A respected aviation monitoring agency. Ten of these saw the aircraft being written off. That’s known as a hull loss. This is when something flies into a mountain or disappears into an ocean. If this livery is where you’re headed – make a run for it! 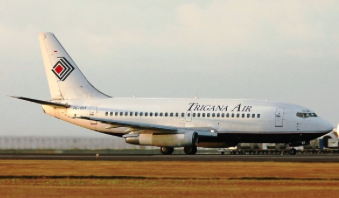 If there was a league for airliners with an accident record, Trigana would be in the Premier League. Trigana aircraft types that have been lost or badly damaged in accidents since 1992 include one Antonov An-72, one ATR 42-300 (prior to the 16 August disappearance of PK-YRN), 13 Twin Otters, and three Fokker F27s. The Daily Telegraph has investigated Indonesia and quote Arnold Barnett, an MIT statistician who specialises in airline safety. His stats show the death rate in plane crashes in Indonesia was one per million passengers – 25 times the rate in the United States. That’s not bad luck. It’s suicidal. In the latest Trigana disaster, a French (and Italian) built ATR 42-300 with 54 people on board crashed – there were no survivors. The ATR-300 variant saw production until 1996. That would make this plane around 23 years old. No problem, far older aircraft are flitting across the globe as we speak. There are Dakota’s flying about for goodness sake! Some hail back to the Second World War. As long as they’re maintained and upgraded, things go well. That’s where we have to poke a stick at the Indonesian Civil Aviation folks I’m afraid. 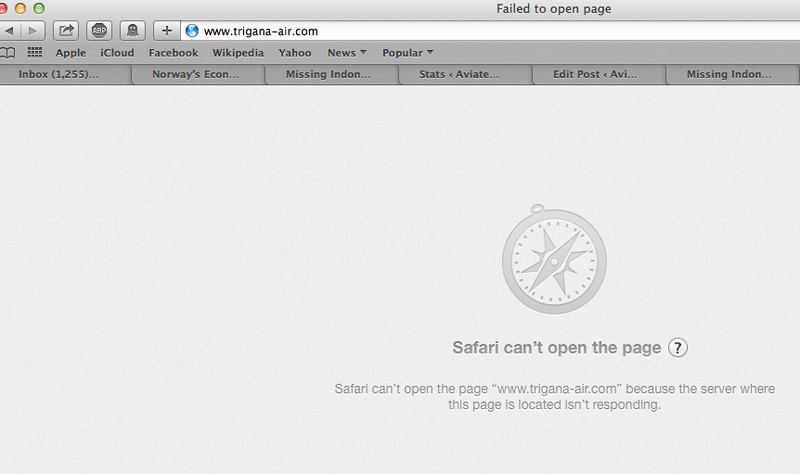 TriganaAir.com. Not working. Like its safety record. Let’s start with the geography of the place. Indonesia is composed of at least 17,000 islands scattered about a tropical sea – and these islands are volcanic. That means they have steep mountain sides and this creates deviations in weather that would make many pilots wince. Look, its not me saying this. It’s the FAA. And the EU. And the USA. Don’t give me that “oh, they just don’t like South East Asians” bilge. It’s because the Indonesian aviation business is full of corruption, nepotism and fraud and you wouldn’t put your mother on one of these flights if you understand just how poorly managed aviation is in that part of the world. What’s made this place even more dangerous is economic growth. The number of passengers flying from island to island grew over 80% between 2006 and 2013. Merchants flogging textiles suddenly wanted in on the action and “bought” licenses or bribed officials to turn a blind eye to a league of lies. Like using non-standard parts, failing to maintain aircraft, breaking basic commercial airline rules. You don’t believe me? When the now defunct Adam Air of, you guessed it, Indonesia, crashed in 2007, 102 people died. Later it emerged that the low-cost carrier which had been number 1 in that country, bribed officials, told pilots to breach safety rules (which is just plain suicide from the pilots point of view) and used recycled spare parts. That my blog pals, is a disaster waiting to happen, and did in December 2014 when Indonesia AirAsia Flight 8501 dived into the Java Sea, killing 162 people. The FAA says Indonesia is particularly weak in pilot training, inspection procedures, technical expertise or record keeping. That’s basically everything that really matters. In this latest incident, the flight was en route to an airfield at 4500 feet, only slightly higher than Lanseria or FALA from which I fly. A plane’s performance is seriously hampered by the altitude and the temperature. Throw in heavy turbulence and a crowded flight, replete with baggage pressing the limits – you get the picture. What is even more thrombotic is the peaks around the airfield PK-YRN was trying to overpass. 9000 feet. The ATR 42-300 has a service ceiling of 25,000 feet, but the peaks are apparently around 10 nautical miles from the airfield. Yegads! That makes for a scary landing and approach, particularly in bad weather and being vectored in by radar. One mistake from the pilot or radar and there’s not much hope of recovery. What’s worse is the culture of getthereitis which prevails when you’re pushing the envelope. We’re not sure at this stage what actually brought down the aircraft. Was the airframe overstressed in the turbulence? Did the crew input the incorrect information in the flight director/autopilot? Did someone working the radar misread the ATR’s transponder and put the aircraft in a collision course with the granite cloud? Let’s wait for the official Indonesian traditional aviation whitewash. Here’s a list of the airlines you don’t want to touch if ever you find yourself on an island in the Indonesian sea. This entry was posted in Uncategorized and tagged Adam Air, Air Asia, Aircraft Maintenance, ATR-300, ATR42-300, aviation, Dakota, EU, FAA, Indonesia, Ok Bape, Papua, Trigana, Trigana Air, US by desmondlatham. Bookmark the permalink.